Back at school we learn that the movement of air from an area of high pressure to an area of low pressure results as wind. To be absolutely precise, wind exist because of the sun, which unevenly heats the surface of the Earth and thus create air movements (hot air goes up, when the cold moves down to fill the place). So as long as the sun shines, the wind will blow. Mariners were capturing the wind to explore the world for centuries, as well as farmers were using windmills a lot. However, today the biggest utilization of the wind power belongs to the wind turbines. Last few years, the use of wind power for electricity has grown vastly, as the generation costs has decreased and the technology has evolved significantly. Generally, there are two types of wind power plants - onshore and offshore. - Carbon and Nuclear free electricity generation – no water or air pollution is caused. - Boost local developments and investments – a wind farm benefits the development of the local area, by using local suppliers, constructors and workers. It also creates better infrastructure, which makes the area easily accessible and eventually helps local tourism. How a wind power plant works? Wind turbines are mounted on a tower to capture the most energy (like windmills). Placed well above the ground, they can take advantage of the faster and less turbulent wind. Wind turbines catch the wind's energy with their propeller (like blades). A blade acts much like an airplane wing. When the wind blows, a pocket of low-pressure air is formed on the downwind side of the blade. The low-pressure air pocket then pulls the blade toward it, causing the rotor to turn (a movement known as “lift”). On other side, the wind force pushing against the front side of the blade is usually called “drag”. The force of the lift is actually much stronger than the drag. However, the combination of both causes the rotor to spin like a propeller, and then by a turning shaft to spin a generator and make electricity. Wind power is a variable renewable energy source: no wind is blowing – no electricity is generated. 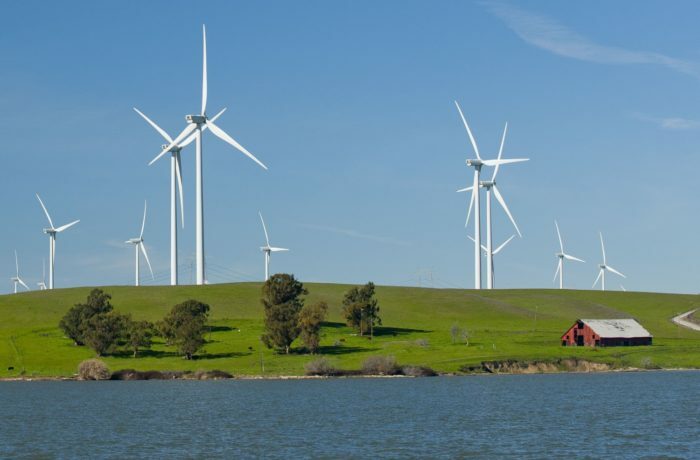 Another drawback of the wind power is that the slowly rotating blades could kill birds and bats. However, the number of those is not even nearly as many as the number caused by cars, power lines, or high-rise buildings for example. Also some people pretend that the wind turbines are ugly and complain about their noise, but this is more personal and subjective perception that being a serious reason to not invest in wind technologies.